Stuff Your Stockings with SAVINGS now through Dec 23rd at midight! ‘Tis the Season for Savings! NOW is the time to register and SAVE BIG!! to register now and lock in savings! *Special applies to new registrations only and is not retroactive. Special ENDS Dec 23rd at midnight! 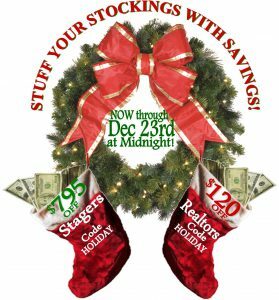 Use Code HOLIDAY to save $795 off the Stager 3 Day Course or $120 off the REALTOR 2 Day Course!